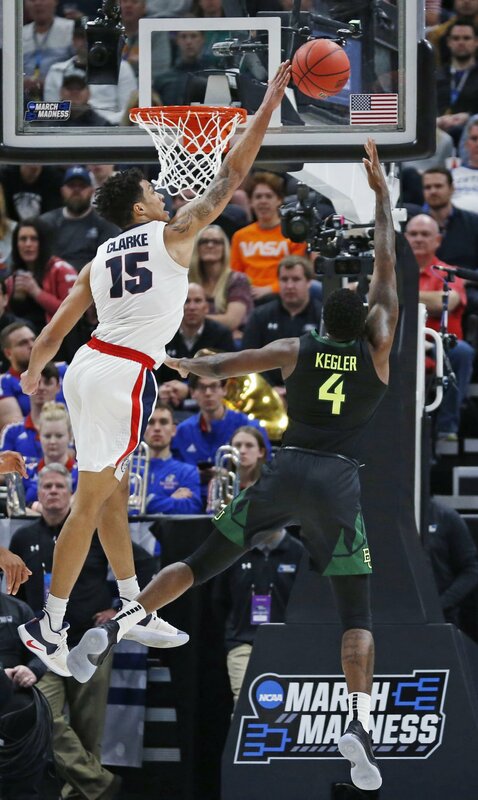 Baylor guard King McClure dunks against Gonzaga during the second half of Saturday's NCAA tournament game, won by the Bulldogs. SALT LAKE CITY — For injury-plagued Baylor, no players were more important in holding the team together than senior guards Makai Mason and King McClure. When center Tristan Clark went out with a season-ending knee injury in early January, gloom and doom pervaded the basketball program. But the Bears reinvented themselves as a transition-oriented offense with Mason, McClure and freshman guard Jared Butler leading the way. Though Mason missed two late games with a bruised toe and McClure was out for a five-game stretch with a knee injury, they were always there to lead their teammates. Mason and McClure played their final game for the No. 9 seed Bears in Saturday night’s 83-71 loss to No. 1 West region seed Gonzaga. Both made strong contributions, as Mason collected 17 points and five assists while McClure scored 15 points. While McClure played all four seasons at Baylor, Mason played just one season for the Bears as a grad transfer from Yale. But he delivered a superb final year as he averaged a team-high 14.9 points and 3.6 assists and showed his toughness by persevering with his toe injury.